I have been working with Amy Van Doran (and Modern Love Club) for three years thus far, and she was my first client before I became a professional developer. 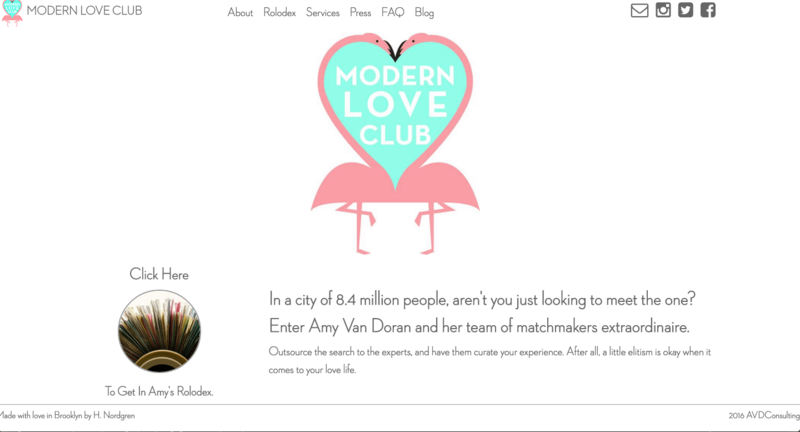 Modern Love Club is a particularly interesting company to work with for two reasons. One,the company likes to change the appearance and functionality of their site often. (This keeps me on my toes!) Secondly, the Modern Love Club site is a good example of watching my progression and improvement as a front end developer on each new iteration of the site. We have currently presented two versions of the site, but have built four versions of it over the last three years. Amy's site is a high fidelity rapid prototype using Bootstrap and jQuery, whilst implementing the MatchMaking pro software via an iFrame. It perfectly meets the needs of the company while allowing for a lot of flexibility in design. You can check out the current result here, as well as seeing some of the works in progress here and here.